ABA’s 5 gallon volumetric, positive displacement, double acting piston units are manufactured from high quality stainless steel and supplied with Teflon seals and gaskets. 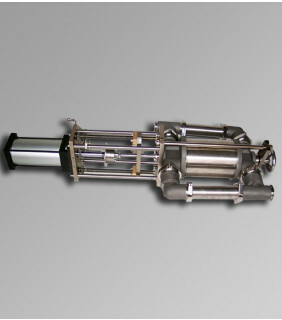 Double acting pumps have product on both sides of the piston, which keeps the cylinder walls and seals lubricated and increases the life of the pump. Our pumps are held together with quick release clamps for ease of maintenance and feature a hand wheel with optional digital position indicator to allow easy, repeatable adjustment of the pump stroke length. As with our one gallon pumps, cleaning is achieved by flushing the pumps with solvent, and maintenance on our pumps is quick and painless, simply loosen the hand wheel on the piston end of the pump, and the entire cylinder slides off for cleaning and part replacement. Our stainless steel cast end caps, elbows and tees are cast here in the USA and are featured on both our 5 gallon pump models. The ABA-2000-GCV is a gravity check valve system. This simply means that the liquid itself pushes aside and reseats the check valves inside the elbows and tees. 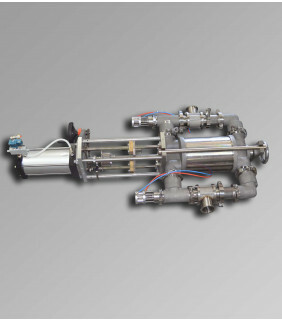 On the other hand, the double acting piston pump ABA-2000-PCV is a powered check valve system. The powered check valves are unseated and reseated with the aid of air cylinders. Each model has their own benefits, but the primary reason for selecting a powered check valve system over gravity check valves would be the incoming pressure from the supply line. Powered check valves also eliminate the need for a filter tub. For more information regarding our high quality volumetric piston pumps, please contact ABA today.